I had read somewhere that ‘if you believe you can fly, you will’ and this is exactly what I experienced at Skydive Long Island, New York. 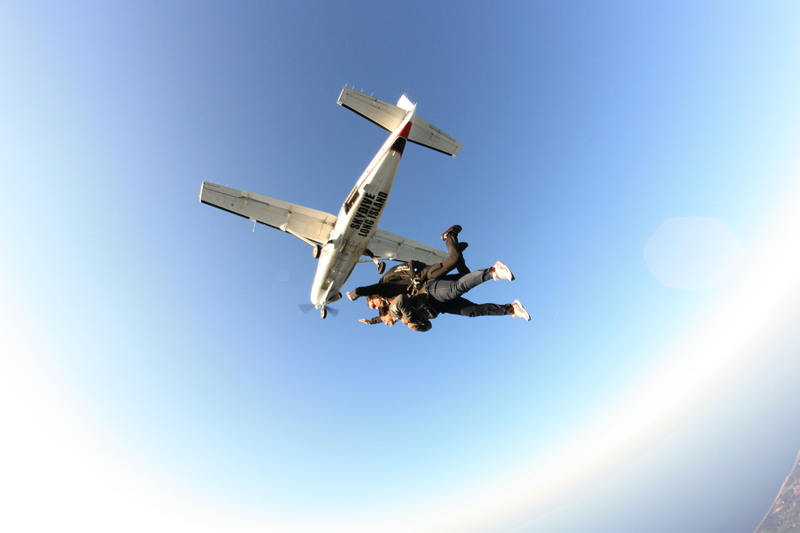 For a lark, I saw myself signing up, where the first thing you are told is that when you Sky Dive, there is a probability that you may die or get maimed for life. Despite these not so comforting words, I had to put on a cheerful expression looking at the excited faces of my friends, . Before I go any further, let me share with you that I have a fear of heights, and terrible motion sickness. Why was I doing this? I like birds, airplanes and the sky and these to my mind are the perfect reason to jump off an airplane. So, we troop into a small plane with two rows of benches. We sit astride with no seat belts, facing the tail. I see a cameraman sitting on the floor. He closes the door which is really a flap like shutter and we take off. As we noisily lurch skywards, I am inescapably committed to jump off the airplane or tag myself a coward. I choose the former, reminding myself that the worst case scenario is death and that I have attended enough Advanced Meditation Courses with the Art Of Living so the death-processshould not be unfamiliar; that I have died before in many previous lifetimes and can do it again. I decide on mudra-pranayam to calm myself. Breathe in…blue sky…breathe out…blue water below… I feel a jab on my back, it is my instructor. A part of me wants to give an Art of Living intro-talk and another wants to whack him because now I’m jittery again!! Thankfully, he wants to talk, telling me about his workplace: the sky. Soon, it is time. We have climbed to 14000 feet and the door is open. I go over the instructions once again, pull on the eye glass and wiggle on the floor till my feet are dangling out of the plane. It feels similar to dangling one’s feet out of a truck; only, this one is in the sky!! There is no turning back now. Breathe in ...and JUMP!!! And I am free-falling towards the Earth. I see the beautiful Atlantic Ocean, green and brown Earth with a river. Strangest of all is that the Earth appears convex, nothing like what we see out of an airplane window. Though we free-fall for about 10 thousand feet, there is no perception of speed or the height ! It is something I have never experienced before. Free Fall is the most magical experience one can ever have. It is a totally new experience for the body and mind. As the body starts taking inputs through the senses and before the mind can add labels and form concepts…you experience the PRESENT MOMENT, one hundred percent, un-adulterated, pure moment !!! As you fall, in that moment there is…no fear, no judgement, no like or dislike, no thoughts…not even thoughts of life/death/ loved ones. It is awareness minus the labels!! It took me a leap of faith to understand the depth of present moment. My sky Dive into present moment set me free. Wow….. what an experience that must have been.. congrats on being so brave…. :). YES !!! The Art of Living is the one that teaches us to be FREE…….. RIGHT NOW !!! Thank you. In that moment I did not feel brave…but in hindsight…YES!! Your writing is so descriptive, that I experienced a virtual sky dive while reading it!!! Super awesome post Alka Didi. I totally agree, Art of Living helps in every aspect of life. Nicely written article. The moment you are free of all worldly things is when meditation happens and even the few moments in the state of meditation make us very productive. Very nicely written and the beauty of present moment shared so well! simple language, profound message ! brilliant ! ‘ To fly ‘ Human Race has been constantly dreaming of it. I am sure it certainly must have been a life time experience for you. The only part u missed was the faith on the Trainer/Partner ro whom you were strapped. He was your guide, for whom you left all the fears. Likewise a disciple should float with knowledge bestowed on him by his Teacher. Teacher should have enough courage to remove the fear of his student and to make him experience a free flow in the world of knowledge. I am proud to be your student, Alka Didi. You are brave, I mean really brave. The moment when it actually comes to practically jumping out from that crazy height… Phew!! !